Ancient Spanish kingdom, bounded by Old Castile, Portugal, and Galicia. The Saracens ruled here until driven out by the Spaniards, who founded a kingdom of their own, which in 1218 was incorporated with Castile. In this kingdom of Leon, with its capital of the same name, Jews were living at an early date, certainly at the end of the tenth century. They were engaged in cultivating the vine and in various trades. Hebrew bills of sale dating from the beginning of the eleventh century have been found at Leon. Before the year 1006 the Abbess of Santiago purchased a vineyard from the Jew Jayu (Haya). Other Jews of Leon are also mentioned in this period; e.g., Ezekiel, Samuel (1007), Vitas-Ḥayyim (1008), Jacob (1031), and Shem-Ṭob (1049). 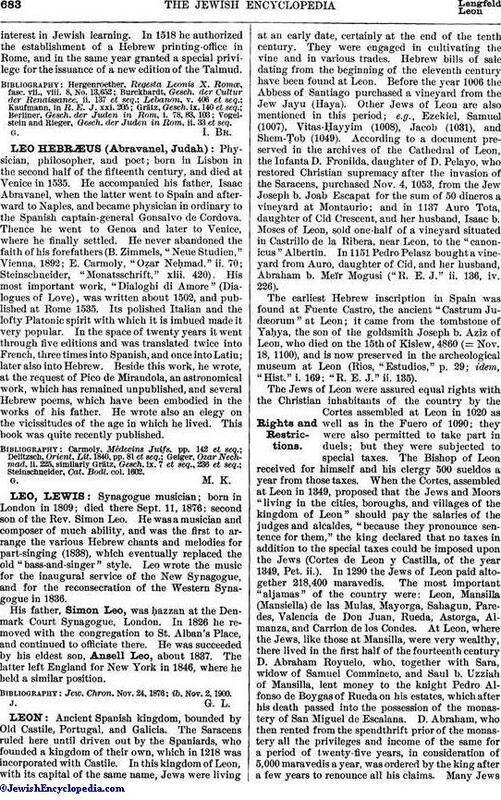 According to a document preserved in the archives of the Cathedral of Leon, the Infanta D. Fronilda, daughter of D. Pelayo, who restored Christian supremacy after the invasion of the Saracens, purchased Nov. 4, 1053, from the Jew Joseph b. Joab Escapat for the sum of 50 dineros a vineyard at Montaurio; and in 1137 Auro Tota, daughter of Cid Crescent, and her husband, Isaac b. Moses of Leon, sold one-half of a vineyard situated in Castrillo de la Ribera, near Leon, to the "canonicus" Albertin. In 1151 Pedro Pelasz bought a vineyard from Auro, daughter of Cid, and her husband, Abraham b. Meïr Mogusi ("R. E. J." ii. 136, iv. 226). The earliest Hebrew inscription in Spain was found at Fuente Castro, the ancient "Castrum Judæorum" at Leon; it came from the tombstone of Yaḥya, the son of the goldsmith Joseph b. Aziz of Leon, who died on the 15th of Kislew, 4860 (= Nov. 18, 1100), and is now preserved in the archeological museum at Leon (Rios, "Estudios," p. 29; idem, "Hist." i. 169; "R. E. J." ii. 135). The Jews of Leon were assured equal rights with the Christian inhabitants of the country by the Cortes assembled at Leon in 1020 as well as in the Fuero of 1090; they were also permitted to take part in duels; but they were subjected to special taxes. The Bishop of Leon received for himself and his clergy 500 sueldos a year from those taxes. When the Cortes, assembled at Leon in 1349, proposed that the Jews and Moors "living in the cities, boroughs, and villages of the kingdom of Leon" should pay the salaries of the judges and alcaldes, "because they pronounce sentence for them," the king declared that no taxes in addition to the special taxes could be imposed upon the Jews (Cortes de Leon y Castilla, of the year 1349, Pet. ii.). In 1290 the Jews of Leon paid altogether 218,400 maravedis. The most important "aljamas" of the country were: Leon, Mansilla (Mansiella) de las Mulas, Mayorga, Sahagun, Paredes, Valencia de Don Juan, Rueda, Astorga, Almanza, and Carrion de los Condes. At Leon, where the Jews, like those at Mansilla, were very wealthy, there lived in the first half of the fourteenth century D. Abraham Royuelo, who, together with Sara, widow of Samuel Commineto, and Saul b. Uzziah of Mansilla, lent money to the knight Pedro Alfonso de Boygas of Rueda on his estates, which after his death passed into the possession of the monastery of San Miguel de Escalana. D. Abraham, who then rented from the spendthrift prior of the monastery all the privileges and income of the same for a period of twenty-five years, in consideration of 5,000 maravedis a year, was ordered by the king after a few years to renounce all his claims. Many Jewsat Leon, Mansilla, and other cities succumbed to the plague in 1348 and 1349. In 1365 King D. Pedro of Castile obliged the Jews of Leon to contribute to the municipal taxes, from which they had hitherto been exempt. The Jews of Leon escaped neither the persecutions of the year 1391 nor the missionary sermons of Vicente Ferrer in 1412. The storm broke out at Benevent, as a dirge says, sweeping across Leon, Valencia de D. Juan, Astorga, Mayorga, and Palencia (Introduction to Simeon b. Ẓemaḥ Duran's "Magen Abot," ed. A. Jellinek, Leipsic, 1855). King Alfonso VIII. commissioned the Jews of Mayorga to guard the castle there. Carrion de los Condes was inhabited chiefly by Jews, who enjoyed ancient privileges. The Jews of Valencia de D. Juan erected in 1379 a handsome large synagogue in place of a small one, thereby incurring the anger and envy of the clergy of that city; the synagogue was in consequence transformed into a church soon after its completion. The Jews of Bembibre, a place not far from the city of Ponferrada, had a similar experience. Together with their coreligionists who lived scattered round about, they had replaced their old synagogue by a larger and handsomer building a few years previous to the general expulsion. It had just been dedicated when an abbot of the city forcibly entered it, removed the Torah rolls, set up a crucifix, and consecrated the building as a church. The Jews appealed to the authorities, who ordered the removal of the crucifix, and the restitution of the synagogue to its owners. The abbot, however, insisted that since the building had been dedicated as a church, it must remain a church, and he carried the matter to the Bishop of Cordova, D. Inigo Manrique, formerly Bishop of Leon and subsequently grand inquisitor. The latter decided the case in agreement with a bull of Innocent IV., dated April 15, 1250, according to which the Jews of Leon and Castile were not allowed to build new synagogues without special permission. As they had not complied with this condition they had forfeited their property rights; and the synagogue, having been dedicated as a church, could not be restored to them. The abbot, however, was ordered to erect instead a substantial new building, 200 feet (five "tapicas") high, 35 feet long, and 25 feet wide, on a site to be assigned to him by the city, and to hand it over to the Jews within six months. This verdict was delivered to the abbot in presence of the representative of the "aljamas," R. Isaac Connueto, on May 19, 1490. 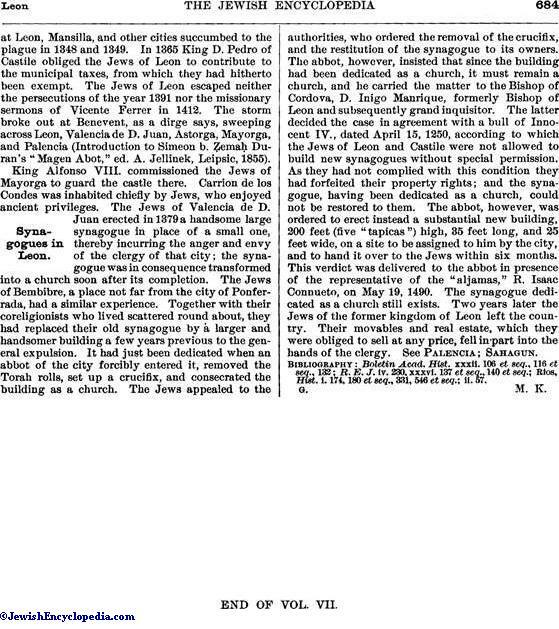 The synagogue dedicated as a church still exists. Two years later the Jews of the former kingdom of Leon left the country. Their movables and real estate, which they were obliged to sell at any price, fell in part into the hands of the clergy. See Palencia; Sahagun. Rios, Hist. i. 174, 180 et seq., 331, 546 et seq. ; ii. 57.